A Fixed Deposit scheme is an excellent facility that is provided to the depositor to preserve a part of their savings. It proffers constant interest flow that is much preferable than equity investment (Share Market) and mutual funds. The tenure of a fixed deposit can vary from 1 day to 10 years. Being an investor, are you curious to learn about What does fixed deposit mean?, Best FD rates in India, how does Fixed deposit work? & Are fixed deposit safe? All your queries will be answered through this post. In this post, we provided a complete guide about Fixed Deposit. Stay tuned for this post to learn about “Fixed Deposit”. So readers, without much ado, let’s proceed further! Fixed deposit is one of the simplest financial instruments provided by the bank or non-banking financial institution which proffers you excellent interest as compared to the saving accounts, the reason, it is considered as one of the preferred financial instrument in India. It is an ideal deposit facility for people of all age group. It is recommended to go for bank instead of any fiscal organization that issues fixed deposit policies to the investors. There are banks that offer high interest in short run whereas others provide higher rate in long run. It is to be noted that interest provided by the bank keeps on updating. You need to check upon recently updated information about interest rates from their respective websites. There are lots of organizations that issue fixed deposit. Though, most of the financial organization live up to the promise where others are the false scheme. So, be cautious while depositing your funds. To avoid any inconvenience search about the company over the internet, check whether it is listed in top trustworthy company names or not. A little hard work and effort will fetch you great profit and updated knowledge too. All you are required to do is to deposit your saved funds in the bank account and see your money multiply with time. Fixed deposits are ideal deposit scheme for people of all ages. However, the higher rate of interest is offered to senior citizen. Typically Fixed Deposit options are mainly considered by senior citizens who want to invest their money in Safe Avenue. It acts as additional income as the rate offered to the senior citizen investors is high. Best Retirement Mutual Funds 2019? The higher the bank rates the higher the risk. While bank fixed deposit is considered more secure than a company’s fixed deposit. In an event of bankruptcy or fraud investor, the investor can’t sell their document to recover the funds. Before opting for company’s deposit investor checks for credit ranking of the leading companies. Credit Rating AAA or AA means that companies have the basic performance strength. Check the interest rate before going for fixed deposit in any company. The interest rate on fixed deposit is charged from time to time. The invested amount is deducted from gross total income to calculate a person’s taxable earning. Below are 10 key things to know about tax saving fixed deposits. Only HUFs and individual can go for tax saving fixed deposit. Fixed deposit account can be open in any bank. Terms and conditions are applied for the minimum amount to be invested. The Lock-In period with fixed deposit is 5 year. Loans against fixed deposit and pre-mature withdrawal are not permissible. Investment in post office fixed deposit scheme with tenure of five years is eligible for tax deduction as per section 80(C) of the income tax act. Fixed deposit in post office can be transferred from one branch to another. The additional advantage is FD interest rates are higher for senior citizens. FD interest calculator is a convenient and user-friendly tool that is accessible online. By using fixed deposit calculator, an individual can instantly compute the interest that he will earn on his deposit. A compound interest calculator helps to compute the interest amount as well as the maturity amount at a compounded rate of interest. 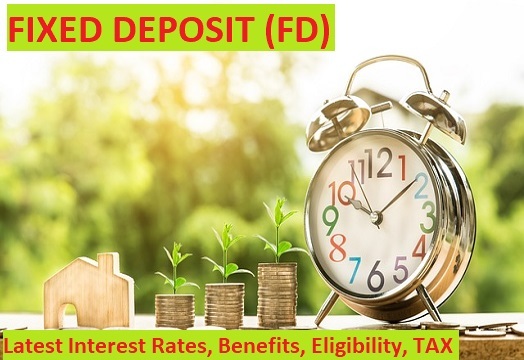 It is a simple and quick tool that calculate computed interest for the fixed deposit on the basis of principal deposit amount interest rate and deposit time span. How does a fixed Deposit calculator work? It is the time span for which the amount is being deposited. FD term can vary from 7 days to 10 years. It’s the rate at which interest will be earned on the deposit amount. The tax deducted is known as TDS. After the deduction, the payee will get the net amount. The payer is legally bound to deduct a tax before making payment. Bank deducts the tax at the end of every financial year. You must be guessing now when to pay tax on income earned by the fixed interest, right? Fixed deposit holder is supposed to pay the tax duly before the end of the financial year i.e 31st March. If a fixed deposit holder earns high income from interest, then he is liable to pay tax on a quarterly basis. Tenure Usually, for FD schemes, the tenure ranges between 7 days to 10 years. The investor can choose a tenure that he is most comfortable with. Tenure for Recurring deposits usually varies from 1 year to 10 years. The customer has to deposit a fixed amount at regular intervals over the tenure. Investment Limit There is no limit on the amount that can be invested in a fixed deposit scheme. But, this limit generally depends on the bank and the minimum investment is Rs. 100 and multiples while the maximum limit is Rs. 1.5 lakh. While there is no prescribed minimum or maximum limit, this usually depends on the bank. Many banks have the minimum investment limit as Rs. 1000 and the maximum limit as Rs. 15 lakhs per month. Rate of Return For a period of a year, the interest rate varies between 6.96% to 8.00%. The interest rate depends on the capital and tenure opted for. The interest rate for FD is slightly higher than that of RD. The interest rate varies between 5.25% to 7.90% for a tenure of one year. The rate of interest usually depends on tenure and monthly investment amount. Tax benefits For fixed deposit, a tax exemption under the section 80C of Income Tax Act 1961 is applicable. Income tax will be not deducted if the interest you earn on your rd is up to Rs.10,000. Documents Required Identity Proof and address proof. Customers will have to submit documents like PAN card, passport and income documents if required. Address proof and Identity Proof. Investors will have to submit documents like PAN card, passport, and income documents if required. Income Interest Interest earned on your FD is taxable and most of the banks deduct TDS. Interest earned on your RD is taxable and most banks do not have the facility of TDS. Withdrawal At the end of tenure. Premature withdrawal is allowed with a penalty. At the end of the opted tenure. Premature withdrawal is allowed with the penalty. What Should You Choose – RD or FD? If you don’t have a lump sum to invest in a Fixed Deposit, but can afford a small portion of investment amount from income monthly a recurring deposit (RD) seems to be the right fit. Both RD and FD are best suited for investors who are risk-averse investors who are mostly in the lower tax slab. Use an online recurring deposit calculator to check to see what suits best for the amount that you can invest. Although one single investment product cannot meet all needs, an RD is considered preferred by many because it puts considerably less financial stress in and gives almost the same returns as FD. It is a tool that is utilized to calculate the maturity amount i.e the returns on your fixed deposit. The tool is easily available online and is quite similar to interest calculator. What are those rules let’s check out! Tax Deducted at source– Interest earned on fixed deposit is taxable. In case income earned from fixed deposit exceeds 10,000 rupees, the bank charge tax at 10% as TDS. Insurance of Fixed Deposit-FD holder receives protection cover on his fixed deposit that is known as deposit insurance. Cumulative Deposit-Tax expert declared that income earned through interest should be displayed every year. If the FD holder failed to display the interest income, it will lead to a mismatch in 26 AS Statement. Cautiously analyze, evaluate and compare factors such as maturity, interest, a penalty for breaking FD before maturity before choosing the fixed deposit and FD bank. Understand the broad macroeconomic factors and expected trends in interest rates. If you expect the interest rates to go up in the near future, opt for a shorter time span FD to keep your options open to investing when interest rates go up. If you expect the interest rates to go down in the near future, you can decide to opt for a longer tenure FD with a high-interest rate. Before parking your excess funds into a fixed deposit account, depositors should also check and compare the tenure wise interest rate offered on FD. In some cases, banks offer a higher rate of interest on FD held for a shorter tenure than on the FD kept for a longer time period. Similarly, it is not required that higher interest rates correspond with longer tenure. Banks may offer a higher interest rate on some selected tenure to manage their internal liquidity position. Last, but not least. Be Careful while planning all your expenses and open an FD only for an amount that you believe you will not need for a minimum period of time. Suppose, if you have excess money Rs. 100,000 but you have a home loan repayment of Rs. 50,000 scheduled after two months. In this case, it is suggested that you deposit the amount Rs. 50,000 in a short-term FD of less than 2 months and the remaining Rs. 50,000 into a long tenure FD. Q. What is the minimum amount that we can be deposit into an FD account? The minimum amount of Rs. 1,000 in FD account you can go deposit but there is no upper cap on deposit amount. Q. What are the important documents necessary required for opening FD? Q. Is the rate of interest on FD provided to senior citizens higher than regular fixed deposit? Yes, senior citizens receive higher rates of interest between 0.25 and 0.75 percent interest rates on their FD. What are the minimum and maximum duration for which I can open an account in FD? For minimum 1 day and maximum up to 10 years although it may differ from bank to bank. Q When do I become accountable for tax? As per the Income Tax Act, 1961 under section 194A when the interest earned on FD in a financial year exceeds Rs. 10,000, TDS is applicable on the credited interest. A depositor may also fill Form 15G/15H to avail exemption from paying tax on his interest income. Q. Can I choose for an auto-renewal scheme while opening an FD? Yes, you can go for an auto-renewal facility at the time of opening the FD account prior to maturity period. Auto-renewal permits your fixed deposit to get renewed automatically for the same period as the original deposit. However, under the auto-renewal option, the time deposit receipt is with the bank’s custody and Memorandum of Deposit (MOD) is issued in lieu of fixed deposit receipt. Q Why Fixed Deposit rate fluctuate? The fixed deposit interest rate flutter due to changes in the prevailing macroeconomic conditions. The several factors responsible for the change in fixed deposit interest consist of a higher rate of inflation, liquidity condition and demand and supply conditions. Q.When can I renew my FD? You may renew FD on the maturity by giving a duly filled FD Application Form 15 day before the date of maturity along with the old FD receipt with revenue stamp of value on it. please note down that, your FD renewal is subjected to the terms and conditions of the FD scheme as applicable on the maturity date of the old deposit. Q. Can I take a loan against fixed deposit? Yes, there are many lenders that provide loans facility against a fixed deposit. The Bank generally proffer loans up to the extent of 75-95% depending upon the lender and loan tenure to fulfill the financial emergency. Usually, loan against FD’s is quick and cheap. I hope this article on “Fixed Deposit or (FD)” has been of great assistance. Thanks for reading. If you like it, Please write to us through the comment section. Any doubts/suggestion or views are cordially invited on this post. Previous articleWhat is SIP? Basics (Systematic Investment Plan) – Benefits, Process, How to Start?